Tenant File’s flexible Features section lets you maintain detailed information about each rental unit. 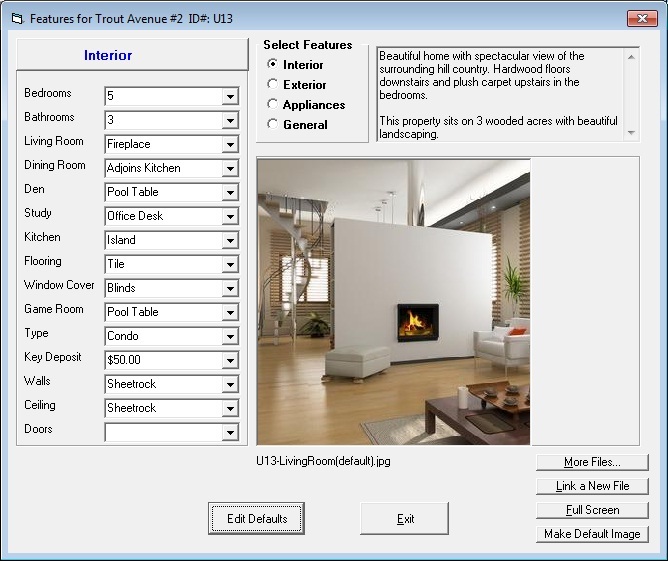 Create up to four major categories, such as Interior, Exterior, Appliances and General Features. Use the preset features or enter your own. Under each major category, create up to 15 subcategories of your choice. In each subcategory, add up to 5 default choices to make entry fast and easy. Enter detailed notes and use the image area to display digital pictures of your choice. Link one default image per Property and unlimited images for each Unit. Display tenant photos, cars, interior and exterior features and more. Click the 'Link a New File' button to link documents such as lease agreements to any rental unit. Now, you can further optimize Tenant File’s great features with our optional RentalWIZ service. Use RentalWIZ to automatically upload Features content to the Internet through your own vacancy listings and other online rental sites.